spas. Mr. Solzhenitsyn was born on December 11, 1918 and died, Sunday, August 3, 2008. The cause of death was a heart condition. Mr. Solzhenitsyn returned to Russia on May 27, 1994, after settling in the hamlet of Cavendish, Vermont, for 18 years. He never became an American citizen while the rest of the family did. 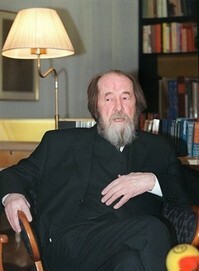 In 1970, Solzhenitsyn won the Nobel prize laureate. Among his memorable literary works were: One Day in the Life of Ivan Denisovich (1963), The Cancer Ward (1968), A Lenten Letter to Pimen, Patriarch of All Russia (1972), The Nobel Lecture on Literature (1972), Candle in the Wind (1973), The Gulag Archipelago, 1918-1956: an Experiment in Literary Investigation (1974). Mr. Solzhenitsyn was to be buried at the Donskoi monastery in Moscow today after a Russian Orthodox funeral service with no state funeral ceremony. The L’Osservatore Romano paid tribute to this great conscience. Also, Andrew Cusack has written a marvelous piece on Mr. Solzhenityn; take the time and read it. May his memory be eternal!